Here you will find a wide selection of fully customized trucks and SUVs from Ford, RAM, Chevy and many more. We scour the region looking for the finest vehicles to add to our inventory. Every vehicle is hand-picked for our inventory and has passed a rigorous multi-point inspection. Wow what a difference it is to be able to go to a dealership and even though I'm buying a truck for my son and I am a woman I was treated with just as much respect as anybody! I was able to get an amazing deal and the staff were all great! They were so accommodating and so patient with me even though I had so many questions because I didn't know a lot about trucks! I would definitely recommend you going there if you would like a nice truck and a great deal! Truly, actions speak louder than words. Allow us to demonstrate the Trucks Plus USA difference to you with a test drive. You can also browse our complete inventory online. From all of us at Trucks Plus USA, we look forward to speaking with you. Have a question? Want to talk something over? Contact us with any questions, concerns or information requests. 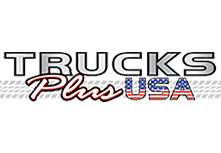 At Trucks Plus USA, your satisfaction is important to us. We’re happy to hear from our customers and we will get back to you real quick. Or feel free to stop in!